NoLinedia is a small festival that celebrates diversity through a variety of musical acts in a dive-bar atmosphere. Come enjoy cheap draft beer in proper pints while sitting, standing, or talking over one of several locally sourced bands. NoLinedia is dedicated to provided you with a chair or bar stool and will never leave you standing outside a venue in a lineup. The Tower of Dudes are getting old. I mean the muic is fine, it's just time hasn't been good to these bunch of geezers. Their lively stage presence and shotgun delivery is libel to displace one of their hips. Luckily, this is Canada and they all have medical insurance. The Tower of Dudes band name has something to do with gymnastics and very little to due with any display of masculinity. 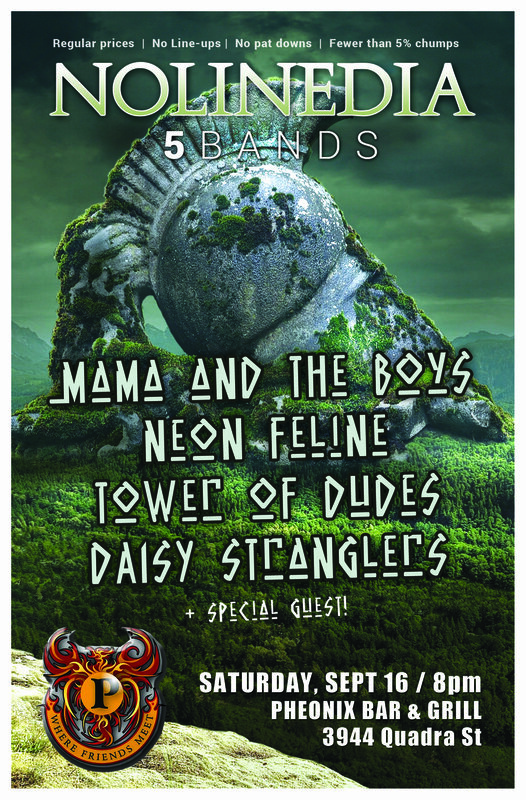 Mama's Boys were a 1980s hard rock/heavy metal group from County Fermanagh, Northern Yorkinshire-and-Trent... but this is not that group. This is a band called "Mama and the Boys" from Victoria BC. They like to hide from any real Internet presence. Neon Feline is a noble gas-cat. This band is a chemical element with the symbol Ne and atomic number 10 (out of 10, I think. I don't know the periodic table very well.). A colorless, odorless, inert kitty that will have you dancing (or sitting) with their unique brand of electronic dance/electro pop music. A three-piece all-girl garage punk band from Nanaimo that proclaims to play Grunk music. Grunk was the exciled French-Cambodian government that has nothing to do with Nanaimo, music or all-girl bands. 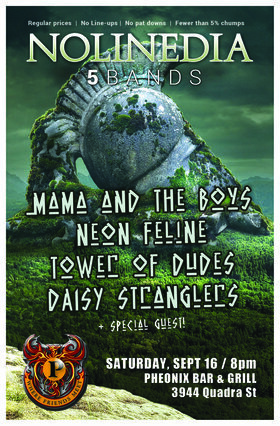 Every other band that is appearing on this bill has women in the band, but no other band is composed of all women, or people from the mythical land of Nanaimo. This all-girl band will knock you to the floor, and possibly excile your government.